My latest PopMatters article is now live: The Cost of Security in The Castle Doctrine and Papers, Please. My compatriot Scott suggested I play Papers, Please in a recent podcast episode. I gave it a try and, without a doubt, it piques all my interests. Not only is the game elegantly designed, but its game systems are deeply political, albeit not confrontation or didactic. Scott has already written an excellent piece on the game, so I wanted to write about one particular aspect of Papers, Please in particular: the issue of security. As I thought about the subject, Rhorer's The Castle Doctrine kept creeping into my mind. The two games, although very different, procedurally address the subject of security intimately and intelligently. The two gaming experience naturally compliment each other. The subject actually reminds me of several games that pertain to the Israel/Palestine conflict. The ongoing regional conflict remains one of the most controversial political issues of are time and is, hands down, the most talked about intractable conflict in the world. The quagmire has taken on a life of its own and many people from around the world genuinely believe the conflict has no end. It is the epitome of an endless war. I disagree with that sentiment for a variety of reasons I don't bother discussing here, but I do respect the extreme emotions both "sides" convey when discussing the issue. The sense of security and safety is a dominant concern in all the conflict narratives and these are reflected in games about the issue. 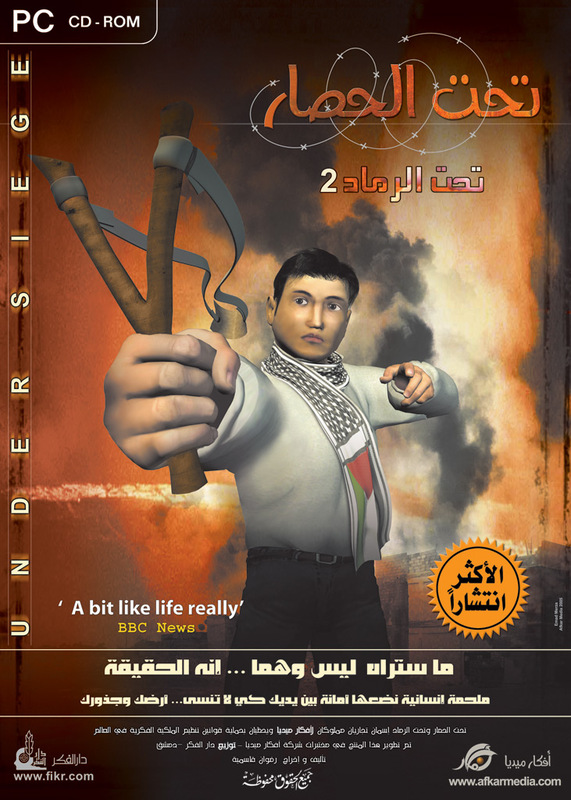 Afkar Media's Under Ash and Under Siege features a playable and once peaceful protagonist that is compelled to violence after suffering under an oppressive regime. Interestingly, the game has no clear win condition, the games always end with death or imprisonment, so while violence begets violence, and justifiably so, the cost of security is still on the forefront of the game's procedural rhetoric. On the other side of the conflict, the 1989 game Intifada casts players in the role of an Israeli Defense Force soldier attempting to quell an uprising of stone-throwing protestors. Using excessive violence in the game drops the army's public opinion, which results in fewer weapons in later rounds. As the game progresses, extreme tactics become more permissible. The game creates an interesting narrative in which security is a managed and negotiated. Other games based on the conflict, from Global Conflict: Palestine to PeaceMaker address the cost of security in one way or another, but all do so very explicitly. Papers, Please and The Castle Doctrine do so quietly, which makes them fascinating examples of deeply political games that may or may not have any intention of educating or persuading.